Click to view any upcoming events by Bathurst AH&P Assoc. Inc. The Reliance Bank Royal Bathurst Show has long been regarded as the best west of Sydney and has boasted an average annual attendance in excess of 20,000 people. 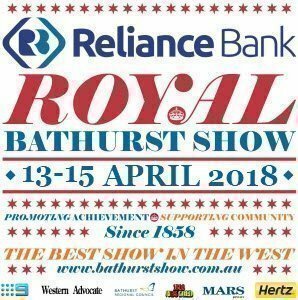 The Show is organised and run by the Bathurst Agricultural, Horticultural & Pastoral Association, a charitable community organisation who since 1858 have been promoting agricultural activities and all aspects of rural and country life in the Bathurst area. The best rides and amusements straight out of Sydney, Cattle, Sheep, Goats, Alpacas, Poultry, Cats, Showdogs and one of the biggest Equestrian Shows in the region with 3 days of Showjumping. Shearing, Woodchop, the Mars Petcare PEDIGREE Yard Dog Championships, the Young Farmers Challenge, a Ute Muster, Bullride, and all the Pavilion exhibits with the Western District and Bathurst AH&P Produce Exhibit. We also have three days of great music and family entertainment in the Family Square supported by Bathurst Regional Council and FREE facepainting and workshops in the KIDS ARENA next to the Teddy Bear Hospital and Reptile display. Not to mention the Animal Nursery and the Izuzu Team D-Max precision driving display, Showtime FMX Moto-X and the best Fireworks in the region. Three days of family fun right in the heart of historic Bathurst. Stay in town and walk to the Show. For more information about the Royal Bathurst Show click here. - Online Ticketholders - Please enter the show via the Cottage Gate. This Gate is immediately in front of the Pavilions. - PER DAY tickets are valid for entry on any single day entry of the Show. - ALL SHOW tickets are valid for entry on all days of the Show. - Child prices are for Children aged 6 - 16 years old. Children under 6 are FREE and require no ticket. - Concession Rates apply to Pensioners, Students and Concession Card holders. Carers providing appropriate evidence such as a Companion Card and accompanying a Concession holder will be admitted FREE. You will be asked to show Concessional ID at the entry gates. - Family Group tickets include a maximum of 2 Adults. - Holders of Bonus Rides E-Voucher Tickets: Please print out your Rides E-Voucher ticket/s - these will be redeemed for coupon sheets at the SHOWTIME OFFICE during show hours. Brought to you by:Bathurst AH&P Assoc. Inc.